Thank you to everyone who voted for former trustee Minna Ireland for the The Guardian's Trustee of the Year 2015, even though Minna did not win we are so proud of the recognition that she deservedly received in being shortlisted for the award. In her time as a trustee Minna has provided exceptional support to our organisation. Often the individual work of our trustees goes unnoticed however we could not have achieved the successes we have without their dedicated support and expertise. All of this work is unpaid and, particularly in Minna's case, constitutes a significant contribution to our shared success. Minna Ireland has been a trustee at One Awards for 14 years. 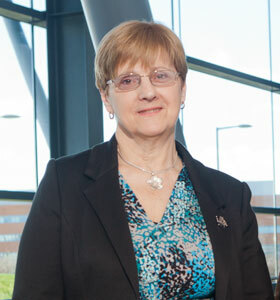 She was first appointed to the Board in 2001 not long after we set up as a Company and Charity having been a department of Teesside University since 1994. In 2014 we changed our Articles of Association to include a term of office for trustees and in October 2015 Minna stood down as a trustee, marking the end of a significant and eventful journey with the organisation. As well as holding the role of Committee member and Chair of the Finance Committee Minna has provided additional support whenever needed; often travelling up the A19 to sign a cheque or participate in a working group. Despite suffering ill health in recent years her support has not wavered and her attendance record at Board and Committee meetings has yet to be beaten! Minna has attended all of our AGMs and Award Ceremonies and often attended ad hoc ceremonies and events throughout the year, presenting awards to learners and centres. Her warm personality and obvious dedication to widening participation in learning have been an asset to our organisation and she has gone over and above her duties because she is passionate about what we do. 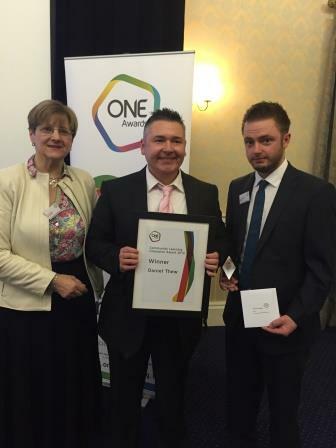 Minna presenting Daniel Thew, winner of the One Awards Community Learning Champion Award 2014 with Shane Chowen, Head of Policy at NIACE, at our Community Learning Awards held in February 2015. She has kept us on our toes by being a critical friend to the organisation and understood the role and responsibility of being a trustee by ensuring the charity remained financially sound and sustainable. She has taken a key role in negotiating service level agreements and supported the organisation through its regulatory and IiP reviews. She always understood the important differences between Governance and Management and has been an excellent sounding board and support for Chairs and Chief Executives as well as a mentor for new trustees. We are delighted that we have had the opportunity to nominate Minna and wish her a long and happy retirement from the role of One Awards Trustee.